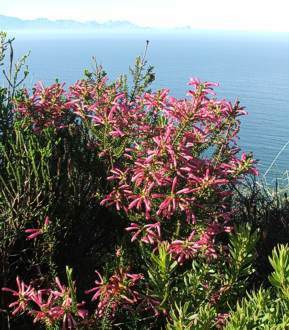 Found only on the Cape Peninsula, this heath is known to older mountain walkers as Erica phylicifolia. 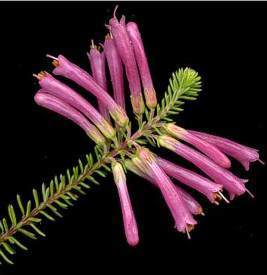 When Dr Ted Oliver revised this section of Erica in 2002, he included this species in the abietina complex. Erica abietina subsp. atrorosea is a sturdy shrub up to 1 m high. It arises from a single woody stem and branches freely to produce a dense shrub. The mid to upper branches are clothed with a dense arrangement of dark green, needle-like ericoid leaves. This species produces pinkish purple flowers, which are slightly sticky and arranged in attractive clusters near the ends of the branches. The flowers are tubular, curved and widen slightly towards the mouth. Flowers are produced from midsummer to midwinter in the Cape (December to August). Erica abietina subsp. atrorosea is an endemic Cape Peninsula species but is common within conservation areas, with a stable population, and so this species has been classified in the Red List as Least Concern (LC). A species is listed as Least Concern when it does not qualify for the criteria of Critically Endangered, Endangered, Vulnerable or Near Threatened. This species is confined to the Cape Peninsula. It is common above Kirstenbosch and on the lower mountain slopes from Constantia Nek southwards to Cape Point. Its habitat is exposed to full sunlight and quite warm conditions in summer. Conditions become milder further south along the Peninsula such as at Cape Point where the close proximity of the sea and persistent sea breezes exercise an ameliorating effect on the climate. It appears therefore that this species prefers the slightly cooler conditions of the southern Peninsula and is fairly tolerant of strong coastal wind. The species name abietina is derived from Latin and means 'like a fir tree', and refers to the leaves which resemble those of fir or pine trees. The subspecies name atrorosea is from the Latin word, atro, meaning 'dark', and rosea, meaning 'rose', referring to the colour of the flowers. Erica abietina subsp. atrorosea is found in Peninsula Sandstone fynbos. This vegetation type consists of poor, well-drained, sandy and stony soils derived from the quartzites of the Table Mountain Series. Its colourful tubular flowers attract sunbirds that feed on its the nectar. The sturdy woody stems serve as good perches for these birds when feeding. Erica abietina subsp. 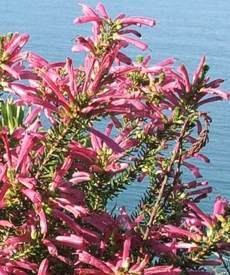 atrorosea is quite hardy in Cape Mediterranean conditions and is a useful addition to a fynbos garden. The red heath should be planted in gardens where it is in full sunlight and is well ventilated. It performs best when planted in rockeries on sloping ground, terraces or embankments and with other fynbos plants. Companion plants may include other ericas, buchus, brunias, and restios. The plant will also do well in a medium-sized container providing that the correct, well-drained growing medium is used. A fynbos planting medium is made up of a combination of equal parts composted pine bark or pine needles and river sand. A little (20 %) loam may also be added. Regular pruning is recommended to keep the plants well branched and compact. Plants that are pruned look better, last longer and produce more flowers. Ericas are adapted to living in poor soils and therefore should be regularly fed with diluted organic liquid or small amounts of organic pellet fertilizers. It is propagated vegetatively by rooting fresh semi-hardwood tip or heel cuttings. Cuttings are rooted in multi-trays on heated benches under mist spray in autumn or spring in a rooting medium of equal parts bark and polystyrene chips. Use a semi-hardwood rooting hormone to aid the rooting process. This species grows easily from seed sown in well-drained, acidic, sandy soil and subjected to smoke treatment. Seeds are normally sown from late summer to autumn (March to May). Adamson, R.S. & Salter, T.M. 1950. Flora of the Cape Peninsula. Juta, Cape Town and Johannesburg. Schumann, D. & Kirsten, G. 1992. Ericas of South Africa. Fernwood Press, Vlaeberg, Cape Town.